While you’re checking if the hotel has a pool and free wifi, see if you can swing a room with a kitchenette or at least a fridge. Meal prepping your favorite dishes will give you the wiggle room to eat before you explore, in the case you don’t find a veg-friendly restaurant. 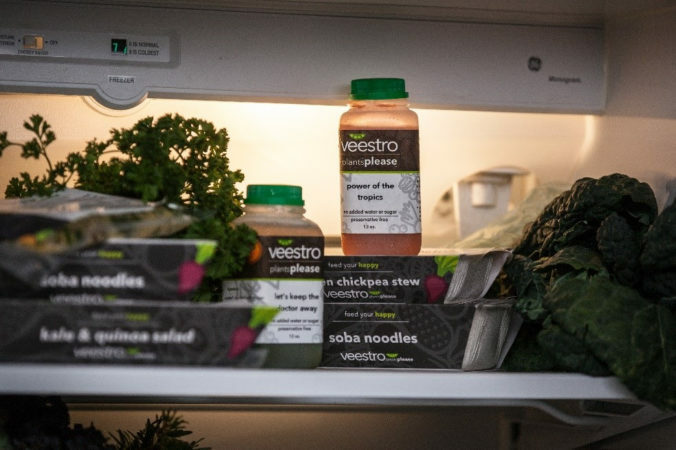 Veestro meals are also handy, since they can be left refrigerated or frozen. Soba Noodles in Peanut Sauce are great to stick in your bag and eat cold throughout the day. Summer is the perfect season to venture into new towns that support farmers’ markets. Chit-chat with the locals, and buy fresh produce to take back to your hotel, or pack as snacks on the go. Chain restaurants don’t often deviate from the menu. You’re more likely to make substitutions with fine dining. Chefs are also likely to incorporate seasonal fruits and vegetables into a curated menu. If you can’t find an entree that speaks to you, try looking at the side dishes. There are often small portion of veggies, like brussel sprouts or house salads. If you’re trying exotic dishes, then you have to learn to decode common key terms. Words like creamy, bisque, béarnaise, béchamel, and au gratinare red flags for dairy-heavy plates. Minced and rare are usually indicative of meat or seafood entrees. When in doubt, go liquid. Do double duty by freeing your mind and detoxing your body. Juices are easy to transport and store. Veestro juices are 100% organic and are hand-pressed without added sugar or water.